When I was a kid I loved to shop for school supplies: a few folders, red and black pens, some crayons and a spiral notebook with a kitten on it. Easy, fun and quick. My, how things have changed. Two of my four kids have lists that are multiple pages in length, and once they get to school there will be additional items we’ll need to buy. A local women’s group puts together kits with all the supplies required for each grade level, but since it’s a fund raiser, the total cost is higher than what I spend doing the shopping myself. Yes, the kit is convenient and the money goes to a great cause (the kids’ schools), but with four kiddos, those extra dollars add up. Plus, I save items from year to year for re-use. Yes, I am that mom that peels the name labels off the barely-used composition books and sends them back the next year. Here’s my process to make the shopping as painless as possible…..in fact, it’s almost fun! 1. Get the lists. Our school district is great about supplying the lists on-line, though I’ve also found the supply lists at local stores in the school supply section. 2. Shop my house. I always save barely used spiral notebooks and composition books from previous years…..every year I find one or two in the kids’ backpacks with maybe five pages used. I tear out the pages, peel off the name and/or subject label from the cover, then save it for the next year. Same with the plastic-pocket-folder-with-brads in every color of the rainbow that each kid needs. Peel off the label and send it back. I realize I’m only saving maybe 50 cents per spiral or folder, but I just can’t stand the waste…..it drives me nuts. Below are a few things that survived last year and are going back to school this year. Notice the pile of brown and pink paper in the lower right corner….those are the darling labels my daughter’s teacher made for her folders and notebooks, reduced to shreds. The colored pencils? Only two appear to have been used, so they’re going back for another year. My soon-to-be 5th grader no longer needs her pink pencil box, so it’s going back to Kindergarten with my youngest. 3. Head to the store. I go to one store and make only one trip. I do not piece-meal my supplies together, buying them only when on sale. I realize I could save even more money if I shopped the sales, but I’ve decided my time is worth more than the money I would save, so I pick a day and I buy everything I can in one shopping trip to one store. My older girls are a great help, each managing their own list while I manage the lists for my younger two kiddos. I usually have to make one more trip to another store to track down an elusive item, commonly one of those aforementioned plastic-pocket-folders-with-brads or the 12×18 manila paper. Why can’t my store of choice ever stock enough??? 4. Sort purchases into piles according to kid, pack into backpacks, sit back and enjoy the smell of new crayons. The other day I looked up the prices of the supply kits from the women’s club…..all four kits would have cost me an average of $25 more per kid than I spent on my own. Multiply that times four kids, and I saved $100….not too bad for about an hour’s worth of time. 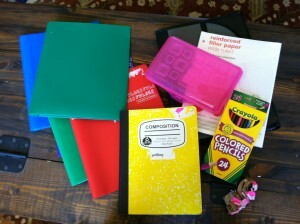 How does school supply shopping look at your house?